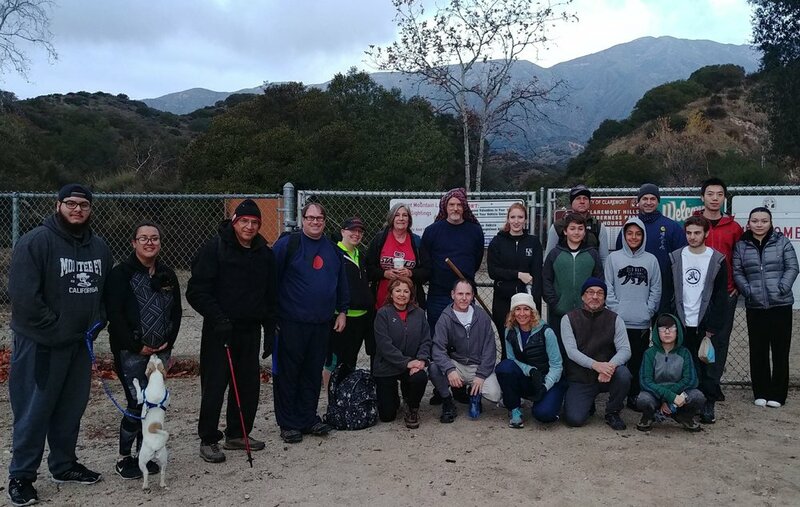 This gang of loonies, pictured here 6:30 AM at the entrance of the 5-mile Claremont Loop Trail, could easily have stayed home in their warm, comfortable beds and forgone the idea of waking up at such a god-awful hour. Who's idea was this anyway? Well, it's a BUDO tradition that goes back hundreds of years: An early morning activity to celebrate a new year of training together, to reignite our passion for life, good health, and the martial arts, to improve our skills, to set goals, and to look forward to the journey. The brisk morning air was invigorating and, yes, cold, however most wore layered clothing and, as we were greeted by the slow but steady sunrise, most adjusted to the warming accordingly. At about 3/4 of the way on the trail we found a landing where we could train (Karate/Martial Arts) for about 45 min. The training consisted of meditation, yoga, warm-ups, basic blocks, kicks, strikes, and progressives, and kata. Some members demonstrated Samurai techniques and kata. Upon completion of the hike, a small group met for breakfast at Legends in Claremont. We had a great time and overall it was a wonderful way to start the day and a a new year. I hope that we will have even more people attend our next special training and get a kickstart toward developing an Indomitable Spirit!